An Alabama tour is by no means a new occurrence. Every year, the award-winning country band tours the States bringing explosive live performances to their fans nationwide. The Alabama band was formed by three cousins in 1969, Teddy Gentry, Jeff Cook, and Randy Owen, in the town of Fort Payne, Alabama. Half a decade later, with several platinum albums and worldwide hits to their names, they have become the most celebrated country band in the industry. In fact, Alabama is revered in most quarters as the pioneers of country music. As recipients of numerous awards from the Academy of Country Music, Country Music Association, and the Recording Academy, Alabama has and continues to be a dominating force in the country music industry. 2019 marks 50 years of these men being together as a group and producing great music for their beloved fans. And they’re celebrating it with their fans in a special way; a countrywide headlining tour that would span a major part of the year. Read on to find specific details of the Alabama band tour schedule. 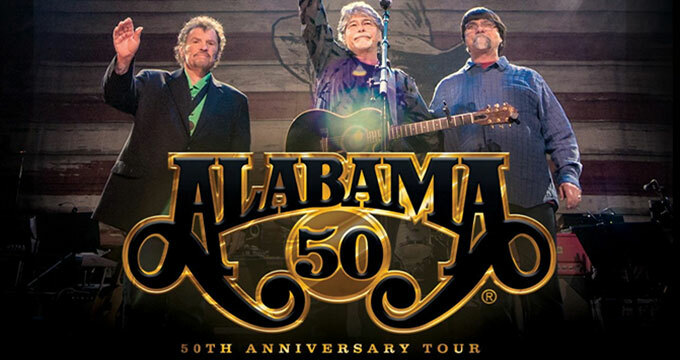 The Alabama band tour is slated to run from January to September. The tour kicked off on January 10 at the Fox Theatre in Detroit, Michigan and would end at Peoria’s largest country music festival, Tailgate N’ Tallboys, on September 14. Along the way, several stops have been scheduled and they include popular cities such as New Orleans, South Carolina, Pittsburgh, Indianapolis, and Connecticut among others. Only 27 events were initially announced for the first leg of the tour and fans were surprised to learn that none of these concerts would be held in Alabama. Though the state had birthed several country music icons including the eponymous band, it had not been included in the original tour lineup. However, the band recently stated that they would make quick and eventful stops in the Cotton State. Orange Beach would welcome Alabama on May 9 at the Wharf Amphitheater while on October 24, Birmingham residents and visitors can watch the band live in the Legacy arena at the BJCC. More Alabama band tour dates are expected to be announced as the tour gets underway. The Alabama tour lineup also features world-class country solo artists and groups that would join the band on specific dates during the tour. These country musicians would also serve as openers on those days. A vast number of the Alabama band tour dates would feature Academy-Award winner, the Charlie Daniels Band, as the show opener. Other Alabama band tour openers gracing this 50th Anniversary Tour include the Marshall Tucker Band, Chris Janson, Tracy Lawrence, Exile, Reckless Heart, and the Oak Ridge Boys. If you are an avid Alabama fan and have not had the opportunity to attend any of their live shows and concerts, then you shouldn’t miss this. The 50th Anniversary Tour promises unforgettable performances and the chance to see these famous icons in person thrilling you live on stage. You get to hear your favorites songs over the past 50 years performed by the men who wrote and produced them. The setlist of songs for the tour comprises popular selections that have touched the lives of millions and would appeal to both old and new fans. Mountain Music, Tennessee River, and Roll on (Eighteen Wheeler) are just a select few of the myriads of songs you would get to hear live if you attend this 50th anniversary tour. Simply check the Alabama band tour dates and venues and find concerts slated to happen in the location nearest to you. Purchase your tickets and as Gentry put it, get ready to have a night you’ll remember.